Since I've launched this site several years ago, I've met some wonderful people....not just online, but I can't tell you the number of impromptu tours that have been conducted on the farm. Even though the goats are just "pasture pets", they still bring great joy. Also, a number of very interesting people have purchased tools. The reasons why they came to this site and the stories they have shared about themselves has been fascinating! Its so rewarding to contribute to their successes. So it just seemed natural to share some of the wonderful experiences with you, the cyber-visitors to the farm. If you have something you think would like nice here, I'd love to consider it. Please send me pictures and copy that I can forward to Jessica, my webmaster. Miter box just before I started. Years ago, while I was still in the Army, we visited my mom's old antique shop in Cottage Grove, Oregon. The place was pretty much closed down, but a few things were still laying around. Among these was a broken Miller's Falls miter box. There was no saw and it was barely hanging together, but the metal parts were still intact. 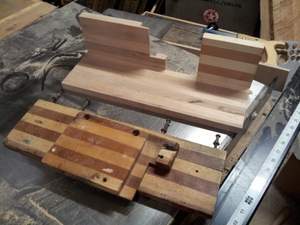 What was left of the wooden frame was made up of maple and mahogany striped laminations. Decals were still on the back and overall, and over all, it was really quite eye catching. along with the parts that will have to be discarded. Mom let me have it, so I brought it back to Kansas and it followed us around for the next several decades. Last winter I was working on my new workbench and was thinking about appliances that would go on it. Down the road, I would like to employ hand tools for the majority of my work. 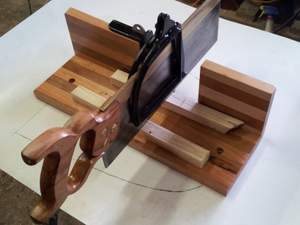 With all this in mind, vices, bench hooks, crochets, etc are easy enough to shop make, but a commercial miter box is usually the better choice. So out came the old relic. I had some maple tucked away as well as some stripped down mahogany pallets stashed in a shed. 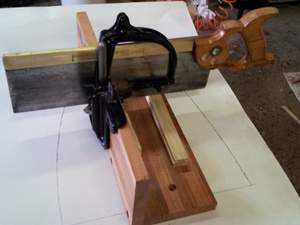 The finished miter box with its new saw. The saw was also rebuilt, but I left some patina on the plate (blade). Here are a couple of pictures from the bench of Eva Anderson in North Carolina. She recently purchased several DS "Jennings" type bits and put them to work immediately. She stated she was very happy with the performance, fit and finish. Wished my bench was as neat as hers! Here's another entry by Eva Anderson. Check out the scroll work on the base for a table she is building. Not sure what the species is but it is for sure hard wood and 4 quarter stock. Notice the squared off edges and crisp detail? What makes this special is that it is all done by hand! Carl Lance, from Michigan, is another one of Shannon Roger's students. Early on, he showed me some beautiful pictures of a post beam drill he is restoring that belonged to his grandfather. This project is about to be finished and will be posted as soon as that comes about. In the meantime he showed me this gorgeous Stanley No. 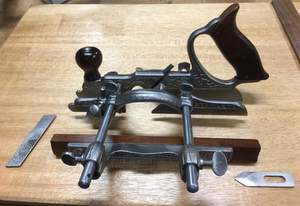 46 combination plane he has reclaimed. 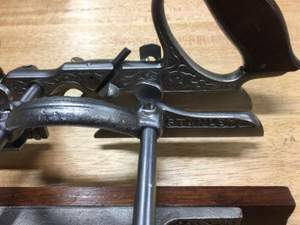 Carl has a gift for restoring the really old and collectible tools. Hopefully we will be able to post more of Carl's work in the very near future. Some time ago Carl Lance sent me pictures of this beautiful old post beam drill in parts, spread out on his bench. Even then it looked extraordinary. What was really special was that this old drill had once belonged to Carl's grandfather. When he first showed it to me, it was already painted and he had just finished the high lighting on the lettering. Shortly after that, he began to work on the stand. Its an innovative idea putting a post beam drill on a mobile stand. Carl says there have been some nay sayers claiming a post beam drill should either be on a structural beam or on a wall....This looks pretty darned good do me. Oh, and the joinery on that stand is hand work. Great job, Carl!